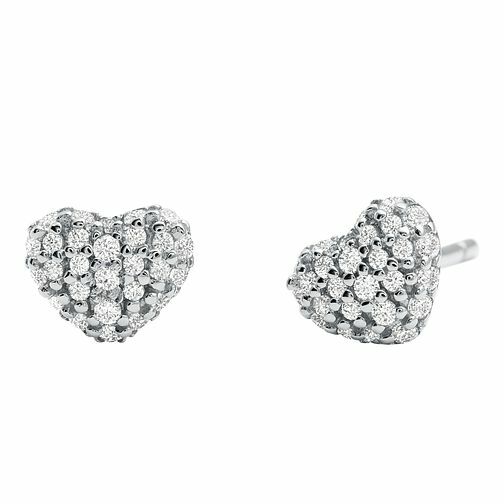 These chic Michael Kors sterling silver heart earrings are the perfect accessory to complement your outfits with subtle feminine charm. Pave set with cubic zirconias to give a contemporary and stylish finish. Michael Kors Sterling Silver Heart Stud Earrings is rated 1.0 out of 5 by 1. Rated 1 out of 5 by Anonymous from Photo very deceiving I have never purchased anything on the Internet before and after this I never will. The pictures make the earrings look nice and big but when I opened the box I needed a magnifine glass to see them. In future will go to a shop so I can see the item. It would be good for earings to be photographed on someone's ear so you get a true sense of the size of them.